When I’m not skiing I like to follow one of the many winter trails around Banff, some longer and more arduous than others. 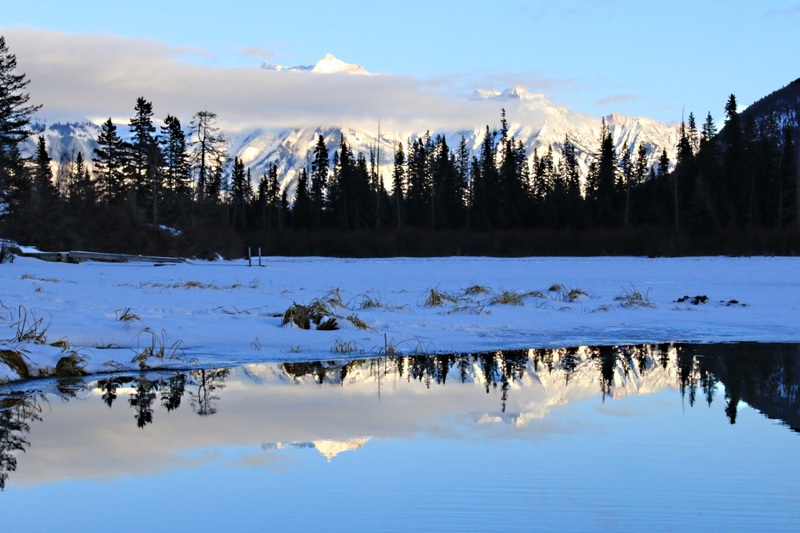 One Sunday afternoon I took my camera and new snowshoes for a gentle 6-mile trek out along 40 Mile Creek on the ‘Fenland Loop’ and then onto the Vermillion Lakes. 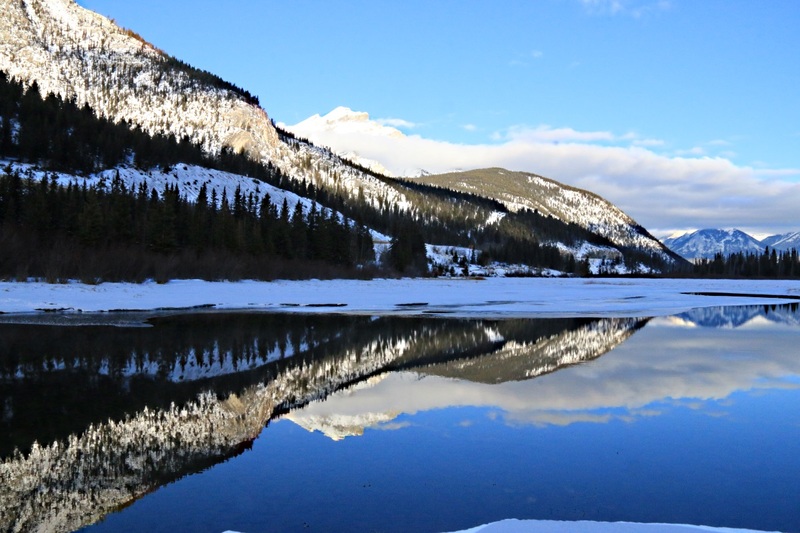 Much of the lakes (there are three of them, imaginatively numbered 1, 2 and 3) are hard-frozen in winter with a covering of snow so a combination of the flotation of the snowshoes on the fine powder of Alberta snow and the integral crampons on the near-bare ice worked well. 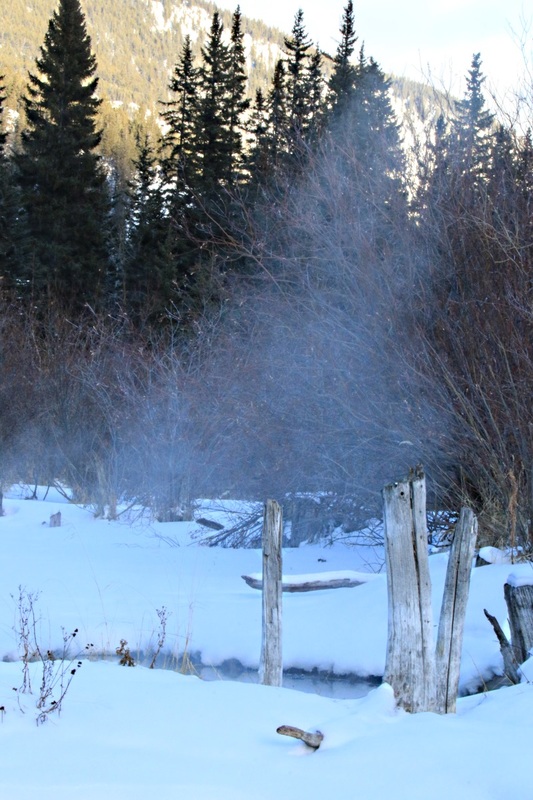 The town of Banff and the Banff National Park came into being because of the discovery of the Hot Springs in 1893. But the thermal springs around the town are not confined to the Cave and Basin area of the original discovery. There are a number of smaller, perhaps not-so-hot maybe just warm, springs. 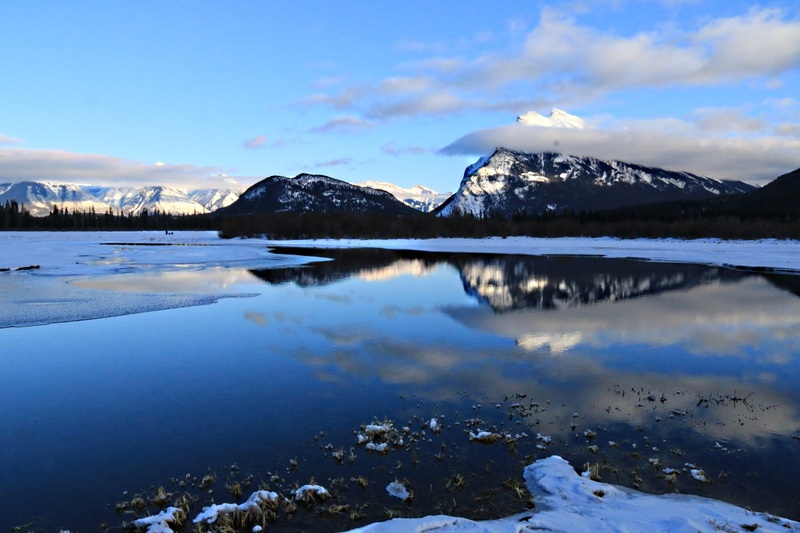 Some of these drain into the Vermillion Lakes and where they do they continue to trickle down even in the coldest of temperatures, flowing water amidst snow and ice, maintaining open pools and channels into the frozen lakes. 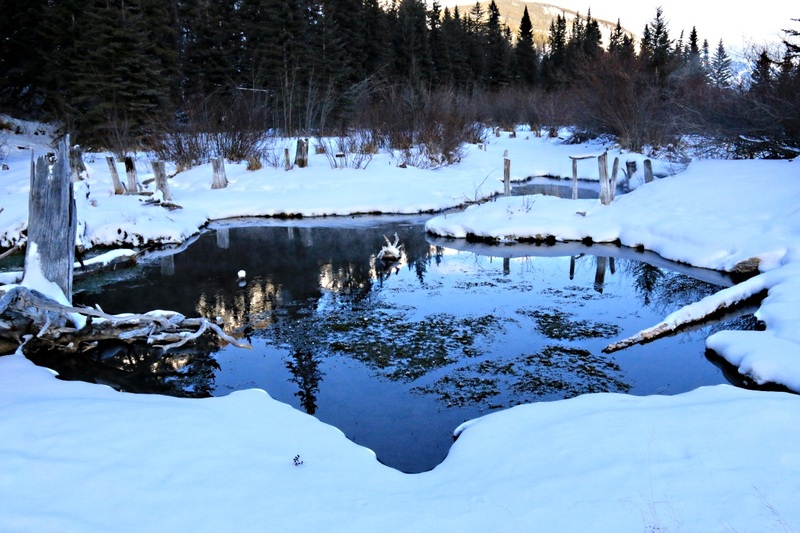 Get the right angle and the right conditions and these pools and channels reflect the blue skies and snow capped mountains which surround them. 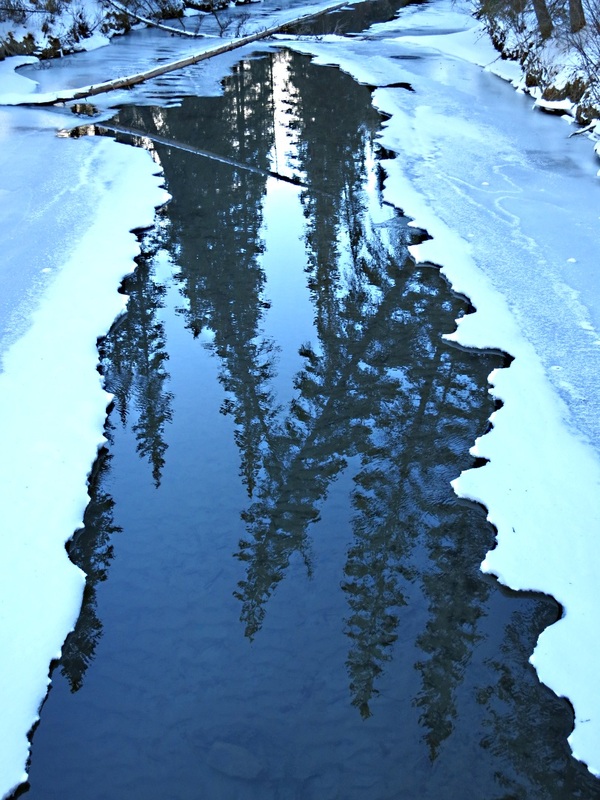 A footbridge crossing 40 Mile Creek at the top end of the Fenland Loop with open water reflecting gracefully bending Lodgepole Pine. 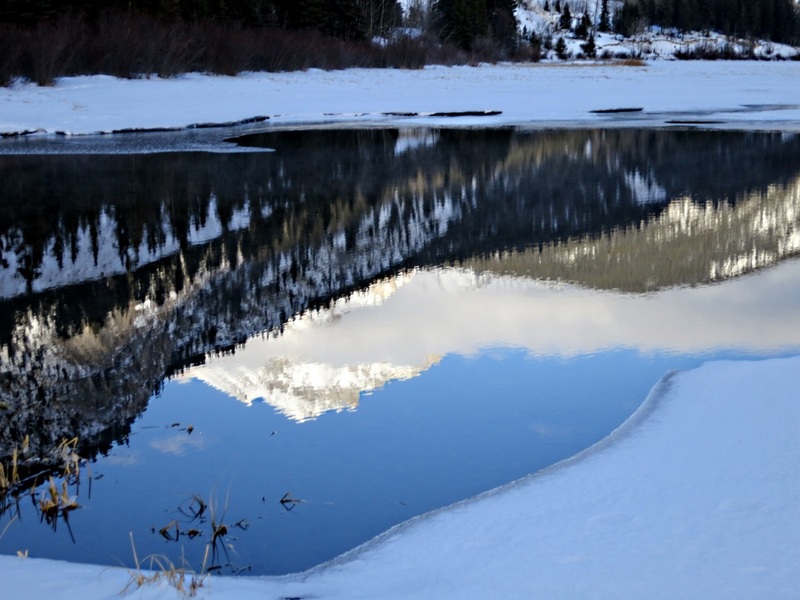 This is stretch is normally frozen over at this time of year. 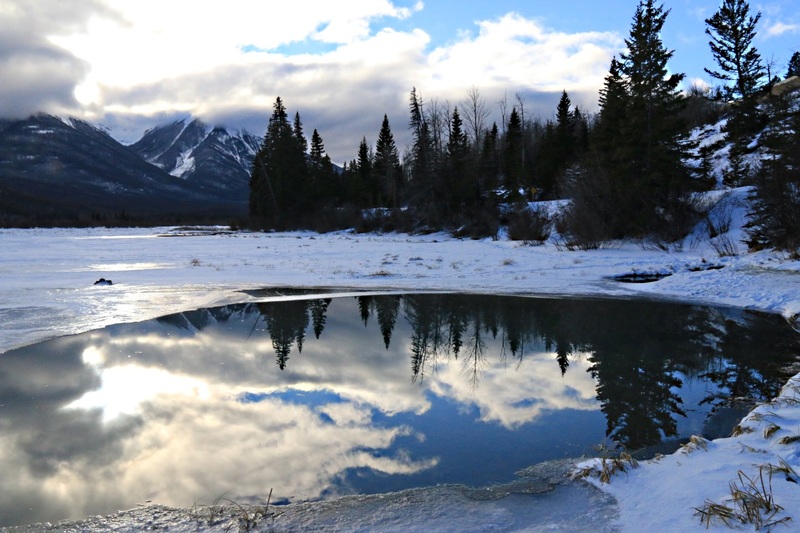 An almost insignificant trickle from a warm spring keeps a small pool open in the ice of the lake reflecting the Massive Range to the west and beyond that cloud over British Columbia. As I moved on from the last shot around the icy edge of the open water an organised ‘photographic trip’ arrive at exactly the same spot, dumped large bags of gear and set up tripods. They had been dropped off by minibus close to the location. No sense of adventure !!! 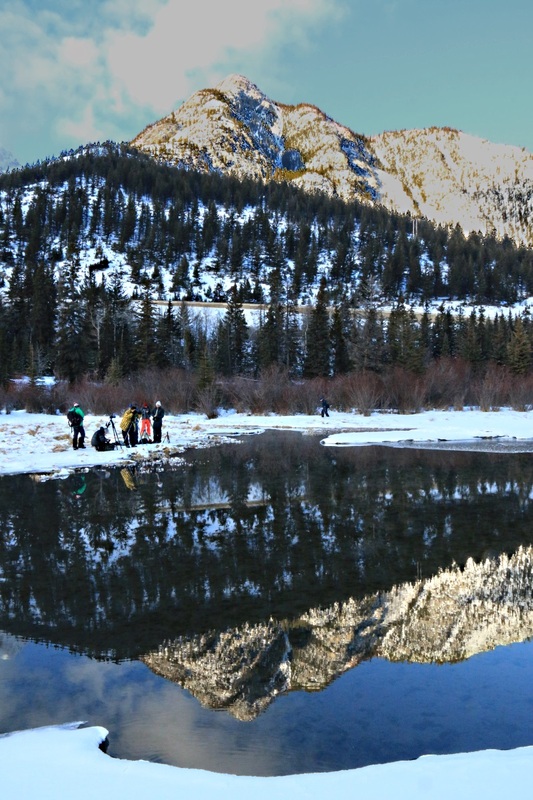 This entry was posted in Canada, Hiking, Landscape, Mountains, Photography, Reflections, Winter and tagged 40 Mile Creek, banff canada, blue sky, Canada, canadian rockies, Cascade Mountain, Cave and Basin Banff, Mount Rundle, photography, reflections, snowshoeing, thermal springs, treks, Tunnel Mountain, Vermillion Lakes. Bookmark the permalink. Thanks Jen. Unfortunately I’m leaving tomorrow (later today on your time) and flying back to Grey Britain. I’ll definitely miss the colour. And the snow. And the skiing.